Thinner than a pencil! 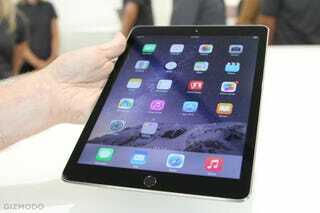 More powerful than an original iPad Air! Able to tell your identity from a single fingerprint! The iPad Air 2 is here, and early reviews agree that it's better than ever. Not necessarily good enough to upgrade from a previous iPad, mind you, because iPads are forever. With no further ado: the Meta-Review. Let's get this out of the way first: Apple's new iPads are the best tablets on the market today. The iPad Air 2, the company's new top-of-the-line device, is substantially faster than its predecessor, which was already more powerful than just about every rival. It sports a terrific minimalist design, almost a millimeter and a half thinner than last year's pretty skinny iPad Air. In any case, the iPad Air 2 really is extremely thin. That’s the salient feature. Less than a quarter of an inch thick (6.1 millimeters). You will definitely bend this thing if you put it in your back pocket and sit on it. Fortunately, you probably don’t have a pocket big enough. Apple says WiFi is much faster on the iPad Air 2 — and wow, do you feel it. Apple could do an ad showing this year's iPad loading webpages side by side with last year's iPad, if it didn't make last year's look like such a slug. NYTimes.com, for example, loads in one second on the new iPad; it arrives five seconds later on last year's model (same WiFi network). The weirdest fact about the iPad Air 2 is that Apple isn't publicizing (or even acknowledging) one of its best new features. The tablet now has 2GB of RAM, up from the rather cramped 1GB allotment in the original iPad Air. As an informal test, I tried loading FastCompany.com in multiple Safari tabs, stopping only when the browser ran out of RAM and had to reload pages from the Net as I switched tabs. On an iPad Air, I was only able to open five tabs before Safari choked. On the iPad Air 2, I was able to open a dozen of them before the browser felt less than snappy. The problem was this: I couldn't tell the difference between the Air and Air 2 while doing these things. The new model didn't seem faster or smoother while running all my apps, perhaps because — like most people — I don't use my iPad for the most demanding video-editing apps or high-end games. It registered pretty much the same network speeds as my Air. The Air 2 didn't allow me to hold or carry the tablet longer and more comfortably than the Air. Its weight of 0.96 pounds isn't discernibly lighter than the Air's weight of one pound. And its thickness of 0.24 inches is a barely noticeable reduction from the Air's 0.29 inches. So I don't recommend that average iPad Air owners upgrade to the Air 2. But what about the vast majority of iPad owners who own older models? That's a different story. That anti-reflective screen also makes a great, though admittedly ginormous, viewfinder for snapping nature shots with the revamped 8-megapixel camera. It takes much crisper shots than before, and in many cases, ones as good as those I can take with my iPhone 6. But I won't bring my iPad to some mountain peak, as some Apple promo shots suggest. My phone's camera is the fastest one for me to grab. For commuters and travelers, the good news is the Air 2, despite being 18% thinner than the previous Air, still manages to deliver 10 hours of battery life. I didn't even take the charger out of the box until after I used the tablet for an entire cross-country flight and then a nonstop morning of checking email and writing. The Air 2 also doesn't have a mute switch, which I didn't think would be a huge loss until I actually found myself trying to use it and becoming frustrated more frequently than I expected. Your new options are to press and hold the volume down button or go into the Control Center and press the mute key; if you used the switch to lock screen orientation, you'll need to do that in the Control Center as well. It is indeed convenient and easy to use Touch ID with apps like Postmates that support it to transact payments, but the bigger benefit here from a general use perspective is just the added convenience of being able to unlock your device with a thumb press. I'm guilty of never having used a passcode on my iPads in the past, simply because unlocking them was too arduous, and because it seemed somehow more acceptable since this was a tablet, not the smartphone I carry around in my pocket constantly. With Touch ID, my data is now somewhat protected, which makes sense since I view and use the same content on both types of devices. The iPad Air 2 is undoubtedly better than any other current iPad, but its advantages might matter less than last year's dramatically-redesigned iPad Air: screen quality, size, and battery life are close enough, effectively, to feel the same. Processor power and camera quality — and Touch ID — are welcome additions, but not needle-movers for the typical iPad user. Year-old iPads have never seemed like better bets. The overall experience of using the iPad Air 2 in 2014 is a case study in missed opportunities and untapped potential. Apple has all but stopped adding tablet-specific features to iOS — the minor two-paned mode for landscape apps on the iPhone 6 Plus is a more significant rethinking of how to manage a larger screen size than anything added to the iPad Air 2 this year. There's no question that the iPad Air 2 is the best iPad ever made. It's also the best tablet ever made — its incredible hardware and enormous ecosystem of apps offer a commanding advantage over the competition. But it's not Apple's best product; it's not the company's most advanced technology in a magical and revolutionary device at an unbelievable price.